Situato nella splendida Breckenridge, Colorado, la nostra residenza cittadina è una unità a tre livelli, con ingresso piano terra, nel complesso Cedars alla base del Peak 9, adiacente a Quick Silver seggiovia. Arredate in modo confortevole con un sacco di spazio, la nostra cittadina è come una 'casa lontano da casa.' In aggiunta ai servizi elencati, la camera da letto principale ha un letto king-size, la seconda camera da letto ha un letto matrimoniale e un letto a castello Capitano. La cuccetta inferiore è un letto full-size e letto a castello superiore è un singolo. Ogni camera ha anche un bagno completo. C'è anche un divano letto queen-size (con materasso ad aria pompa elettrica) nella zona giorno. Con una piscina e vasca idromassaggio in fondo all'isolato e negozi del centro, intrattenimento, e ristoranti a pochi passi, c'è sempre qualcosa a disposizione di tutti. L'ora legale è altrettanto divertente come la stagione sciistica, con un sacco di attività. L'area Summit County si rivolge davvero ai turisti. Spesso, ci sono festival di qualche tipo in corso durante l'estate, insieme a tutte le altre attività ricreative che si godere in una bella montagna Impostazione. Durante la stagione sciistica i biglietti di risalita Breckenridge sono validi a Keystone, Arapahoe Basin, e Vail anche. Si potrebbe prendere in considerazione cercando lo sci notturno a Keystone. C'è un servizio di navetta avanti e indietro per ciascuna delle località. Oltre allo sci e lo snowboard, c'è anche tubing e pattinaggio. Attuale e moderno. L'intera unità è stata ristrutturata tra cui una cucina occhiello, 3 bagni aggiornato e la stanza del sole nella camera matrimoniale. Awesome spring break ski vaca! 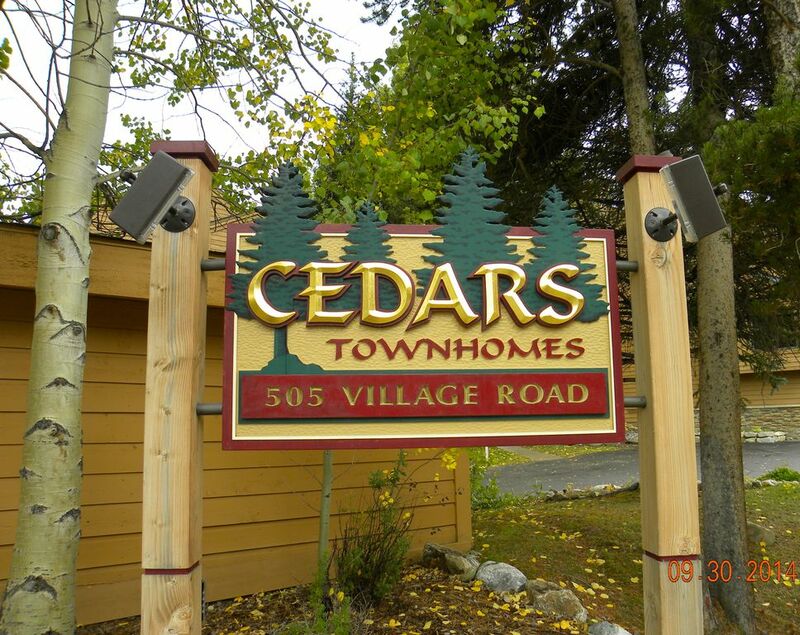 Cedars 8 was so comfortable and Bob and Cindy have thought of everything to create an enjoyable stress-free vacation. The beds were comfortable, there are humidifiers, chairs for the patio, spacious fridge, trash compactor (so u aren’t taking trash out every day), Kleenex, dish detergent, trash bags, updated appliances and every kitchen utensil and dishware you could possible need. The location is very convenient to Peak 9 ski school and the Quicksilver Lift...walk out the garage and you are at the lift in 3 mins. Ski in ski out! Wonderful location and fully stocked! We really enjoyed our spring break ski vacation at Cindy and Bob’s condo at the Cedars. Great location for skiing - very short walk to the slopes. And great for getting to Main Street for shopping and meals. No car needed! This is our third spring break in Breck, and this was definitelly my favorite location. The condo was very comfortable for our family of 5 - the 2nd bedroom with three beds was really great so each kiddo had their own bed. The kitchen was well stocked with anything you might need to cook a good meal and the appliances are very nice. We loved having the garage to store our ski gear - very easy and convenient for getting out on the slopes in the am. The one recommendation I would have for folks who like to sleep in darker rooms - bring an eye mask. The window coverings are fairly sheer, so light comes through (and there are lovely sky lights in master bedroom, so that room is particularly light). This wouldn’t be an issue for everyone - but I prefer room darkening shades and a darker room for sleep. But other than that personal preference, the condo was great!! We would definitely stay there again. My family and I loved this place. Quick and easy access to the slopes. Wonderful space with simple ski in / ski out location. Bob and Cindy have created a wonderful home away from home. Their place is comfortable and has everything that you may need. As others have remarked, the kitchen is amazing. The location is excellent, being just a short walk (less than 100 feet) from the slopes and less than a 5 minute walk to Main Street. We loved our stay there and look forward to returning. The place was clean and recently remodeled. Appliances were new. You can't beat the location, close to both the town and skiing. Discounts are available for stays longer that 5 days, early season bookings, return renters, and military personnel. Quotes available. As of February 1st, there is a 20% discount on all open dates for the remainder of the ski season.